Even though the College Football Playoff (or CFP) is a rather recent development, the year-end mini-tournament has already made its mark as one of the most anticipated sporting events of the year. Though limited to only the top four teams in NCAA Division I football, the interest generated by legal college football playoff betting rivals that of any major professional or amateur sports tournament. And, as with all other sports tournaments, the vast majority of the betting that takes place on the CFP occurs through the use of legal online sportsbooks. Because federal anti-gambling laws like the Wire Act and the UIGEA only ban US residents from accepting sports bets in a business or commercial capacity, it is actually totally legal to place bets on sporting events, provided you use an overseas bookie (or, thanks to the Supreme Court’s elimination of PASPA, aka the Professional and Amateur Sports Protection Act of 1992, a state-based bookie once such businesses are finalized and regulated in your area). Fortunately, the Internet makes finding and using a reputable online sportsbook so simple that it only takes a few short minutes to get set up for legal College Football Playoff betting. In other words, you don’t have to make a trip all the way to Nevada – or wait on your state to formally legalize sports betting within its borders – just to put action on a full menu of Las Vegas-style CFP bet types. If you’re already familiar with online sports betting in general, you should have no trouble understanding the basics when it comes to wagering on the CFP. Like regular season games, the types of legal College Football Playoff betting available to gambling enthusiasts are largely of the standard varieties, including point spreads, straight bets, totals bets (a.k.a. over/unders), alternate lines, props, parlays, teasers, pleasers, and more. The only difference between regular season and playoffs betting is that, with legal CFP betting, gamblers tend to have more choices in each of the above categories. Not only is this a savvy business move on the parts of the top legal online sportsbooks (who are eager to maximize every last bit of action on the three biggest ballgames of the year), but it’s a reflection of the actual status of the games themselves. Under such a national (and even international) microscope, every individual and group statistic is hyper-scrutinized, analyzed, and debated. As such, you can expect tons of player props and team prop bets in addition to the basic betting lines. And as always, legal College Football Playoff betting uses the American moneyline system, which makes everything easy to understand, even for first-time bettors. Aside from the basic wager types, one of the most engaging ways to wager on the CFP is via live betting (or in-game betting). Live betting on the College Football Playoffs is 100% legal, and you can do it from anywhere. All you need is an account at a top online sportsbook like Bovada or SportsBetting, a computer or mobile device, and an Internet connection. The advantages of live betting on the CFP are that, instead of being limited to pre-action bets on performances and scores, you can actually immerse yourself completely in the game by wagering on literally every single snap. A persistent Internet connection makes this possible, and all the best online betting shops have dedicated systems to ensure that you get the most up-to-date odds on every new down. With CFP live betting, you can choose from among literally hundreds of unique wagers for every single football game. And more chances to wager means more chances to win. One of the quickest, easiest ways to enjoy legal College Football Playoff betting is to do so on your mobile device. Granted there aren’t any official mobile College Football Playoff betting apps (thanks, Apple and Google! ), every legal online sportsbook worth its salt has gone the extra mile to provide its members with a mobile interface optimized for on-the-go betting. Since these mobile betting portals are built around smartphone and tablet web browser frameworks, you don’t need a specific device by a specific manufacturer to take advantage of the convenient, small-screen features offered by sites like Bovada and SportsBetting. 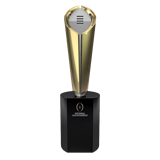 All you need is an iPhone, iPad, Android phone, or tablet, and you can wager on the CFP from anywhere in the country. As long as you have a signal and some cash in your account, you can pick the winners no matter where you are. Legal College Football Playoff betting is as portable as it is profitable! For the 2017-2018 NCAA football season, the Division I College Football Playoff bracket has been set – and, boy, did it come down to the wire! With the dust settled on a wild regular season, the second-ranked Oklahoma Sooners will host the third-ranked Georgia Bulldogs at the Rose Bowl in Pasadena, CA. At Bovada, the current College Football Playoff betting odds for this matchup have the two teams in a dead heat, with the spread sitting on pick-em. However, SportsBetting currently has the Bulldogs as -2 favorites, with an over-under of 60 points for the contest. In the second leg of the tourney, top-ranked Clemson hosts fourth-ranked Alabama in the Sugar Bowl in New Orleans. Both games will take place on January 1, 2018, with the winners to play each other in the 2018 College Football Playoff National Championship game on January 8 in Atlanta, Georgia. Most major sportsbooks all have the Crimson Tide (-145) as 2.5-point favorites over the Tigers (+125), and the game carries a 47-point over-under, hinting at an expected defensive struggle. If you’re getting ready to wager on the big games for the first time, you definitely want to make sure you stick with legal College Football Playoff betting. If you live in Nevada, doing so is easy enough, as the state has a monopoly when it comes to on-site sports gambling. However, you can also make legal wagers on the CFP by using a legal online sportsbook. These businesses operate overseas, and they’re exempt from the various anti-sports-betting laws that govern the other 49 US states. Because of this offshore sports betting “loophole,” it’s perfectly within the letter of the law to bet on the CFP – and any other competitive event – simply by signing up at one or more online betting shop. While there are literally hundreds of online sportsbooks to choose from for legal gambling in the USA, most of them are untrustworthy and lack the tried-and-true, time-tested pedigree of the industry’s top choices. The best sites for legal College Football Playoff betting, then, are the usual suspects, with Bovada, SportsBetting, BetOnline, 5Dimes, and a few others making the cut. No matter which of these services you choose to do business with (and you can always choose more than one to shop around for the best odds), you can rest assured that you’re getting the best lines, the best customer service, and the most secure, private wagering action anywhere. It doesn’t hurt that each of these sites also offers multiple perks and bonuses, and that they each also accept a variety of payment options for every kind of customer, no matter their financial situation. Unlike Bovada, folks in all 50 states can take part in legal College Football Playoff betting at SportsBetting. The experience is first-class all around, with industry-leading options and menus boasting dozens of bet types for each and every event. The brand’s mobile interface is extremely simple and straightforward, making gambling on your favorite collegiate team a breeze. SportsBetting also offers new customers a slew of bonuses, including a 75% Welcome Bonus, a 100% Bitcoin Bonus, and a world-first 25% Bonus For Life program. Generally speaking, it’s a simple thing to deposit into legal College Football Playoff sportsbooks like Bovada, et al. While each site has its own varying limits on deposit types and amounts, they all cover the basics, making it easy for just about anyone to put a few bucks into their accounts. That said, it is important to remember that legal College Football Playoff betting is a time-sensitive proposition, as the tournament is fast approaching. As such, you’ll want to use as fast a deposit method as possible. Since things like money orders, wire transfers, and personal checks all take up to two weeks to clear (and come with exorbitant processing fees), it’s best to deposit funds into your legal online sportsbook of choice via credit, debit, or Bitcoin. These methods carry much faster transfer times and much smaller fees, making them ideal for safe, secure funding at all reputable Internet betting shops. Once you’ve cleaned up big-time, you’ll no doubt want to know how to collect your legal College Football Playoff winnings. Unfortunately, this process is slightly more limited than the deposit avenue, simply because you usually can’t receive your payouts via credit or debit card chargebacks. Thus, you’re essentially limited to requesting a courier check or bank transfer. Again, these methods are slow and expensive. Fortunately, there is a better way. If you use a cryptocurrency like Bitcoin (SportsBetting also accepts Litecoin), you can receive your winnings directly. Instead of waiting to collect your cash for a week or more, Bitcoin transfers typically take less than half an hour to go through, and you’ll avoid all the pesky processing charges that would otherwise eat into your profits. Even better, Bitcoin itself is a potentially lucrative investment, and it’s quite possible that your winnings would appreciate dramatically if placed in that system. Sure, it might be a gamble, but that’s what you’re here for, right? Honestly, nothing goes better with legal College Football Playoff betting than Bitcoin – It’s as if the two were made for one another. Is Betting On The College Football Playoff Against The Law? Absolutely not. You cannot be arrested for betting on the College Football Playoff, unless you get caught up using a local bookie in a state where such activities are against the law. As long as you stick to doing all your sports gambling at a trustworthy Internet betting shop, you can enjoy the pastime without fear of government reprisal. Is Betting On The College Football Playoffs Safe? As with all things, putting action on the College Football Playoffs is only as safe as you yourself make it. If you use a top online sportsbook like Bovada or SportsBetting, and you do not risk more money than you can afford to lose, then yes, legal College Football Playoff betting is perfectly safe – and a whole lot of fun. What Is The Minimum Age To Legally Bet On The College Football Playoffs? Since most states do not explicitly cite a minimum age to legally bet on the College Football Playoffs (or any other sporting event), it is generally advised that you wait until you’re at least 21 years old to sign up and play. That said, the minimum age for membership at Bovada and SportsBetting is only 18, so even if you aren’t 21 yet, at least you won’t be running afoul of those sites’ terms of service. Yes. Definitely. Absolutely. The surest way to spur the hides of the powers that be is to deny them their unfair share of your earnings. As such, Uncle Sam has carved out a special place in his IRS’ system of nonsense for gamblers – sports and otherwise – to claim their income. Form 1040 and Form W-2G are the requisite documents to satisfy these requirements. Remember, legal College Football Playoff betting is by no means a legal tax dodge. As long as you keep clear records of your gambling wins and losses, you shouldn’t have any problems come April 15.